What's The Difference Between Biodegradable, Degradable And Compostable Bin Bags? Find Out Which Eco Bin Bag Is Right For You! 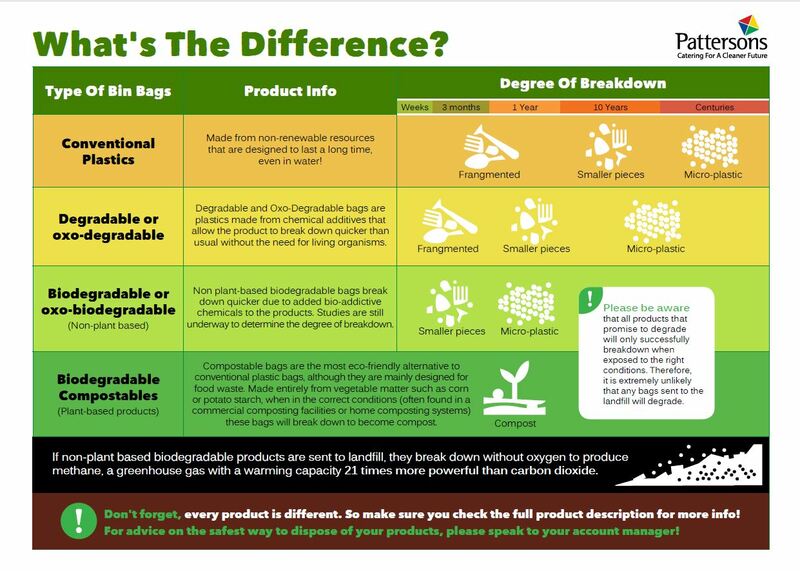 What’s the difference between conventional plastic bags, biodegradable plastic bags, degradable plastic bags and compostable bags? If you’re looking for eco-friendly alternatives to your conventional plastic products to help stop plastic pollution, it can be extremely confusing to decide which product is right for you as well as what’s the “most” eco-friendly option, especially when there’s just so much technical jargon going on. There are a lot of words that are often associated with being eco-friendly, although it dosen’t necessarily always mean the product is eco-friendly. The words you’ve probably been seeing and hearing a lot are “degradable”, “oxo-degradable”, “biodegradable”, “oxo-biodegradable”, “bio-plastics” and “compostable” but what exactly do they mean!? If a product is described as being degradable, oxo-degradable, biodegradabale, oxo-biodegradablae, bio-plastic, bio anything or compostable, can I assume it’s eco-friendly? Absolutely not. Technically, biodegradable means anything that breaks down. For example, wood will eventually degrade, but a wooden shed is designed to be long lasting! There’s a big misconception that anything that has the words “bio” or “biodegradable” in it are eco, but that’s not always the case and there’s a big miss use of the word in the industry. You should always check with Pattersons and your Pattersons account manager to find out the best eco-friendly options and understand the product better before purchasing! So what exactly do all these words mean? What’s the difference? Sadly there are no 100% eco-friendly alternatives to conventional plastic bags for general waste. For food and light waste, biodegradable compostable bags are a fantastic option. If sent to a commercial composting facility, they will turn into compost. Plus, they are made from entirely renewable resources which is great too! There’s a lot of on going research on the degree of break down of every type of bag. Whilst some brands promise the bags will break down within a certain time period, the topic is still very much open for discussion as a lot of research is being carried out on the products but one this is certain: if any bag is sent to the landfill, it will not breakdown! Will the waste go to the landfill? If the answer is yes, then sadly, there are no eco options. Compostable bags are the most eco due to being made from renewable resources but they are only suitable for light waste. Plastic, degradable and oxo-degradable will each be the same in the landfill whereas non plant-based biodegradable bags will release methane, a greenhouse gas with a warming capacity 21 times more powerful than carbon dioxide. What do my local council or chosen collection scheme do with the bags? This is a question you’ll need to have with your collection facility. Each bag needs to be in certain conditions to break down as advertised for example heat and sunlight. If your collection facility disposes of your bags to the conditions required for example, a composting facility, then great, but if not, then they will sadly not break down! What kind of strength bag do I need? If you only have light waste such as food, then compostable bags are great but not for heavy duty waste. Once you know where you waste is going and how it’s being disposed of, you should be able to choose a suitable waste bag. I still want to help the environment. Is there anything else I can do with my rubbish? Yes! For some types of waste such as paper waste or plastic, consider if you really need a waste bag or if just using a a recycling bin would be sufficient enough. Reducing waste and recycling as much as possible is extremely important to helping our planet and we have a fantastic range of recycling bins that can help you do this as well as a number of eco cleaning products and eco catering products that will help you reduce your single-use plastic usage! If you really need to use a bin bag, a lot of our plastic bags are made from recycled plastic to help reduce plastic waste! Eco Terminology – What Does It All Mean!? A substance or object that can be reused. A product that has been made from products that have previously been used to avoid them going into the waste. A renewable resource is a resource which can be used repeatedly and replaced naturally such as plants. Commercial or industrial composting is large-scale composting area which is designed to handle a very high volume of organic waste. A gas that contributes to the greenhouse effect by absorbing infrared radiation. Carbon dioxide and chlorofluorocarbons are examples of greenhouse gases. Carbon dioxide (CO2) is a colourless, odourless and non-poisonous gas formed by combustion of carbon and in the respiration of living organisms and is considered a greenhouse gas. Emissions means the release of greenhouse gases and/or their precursors into the atmosphere over a specified area and period of time. Polylactic acid (PLA) is a type of plastic that is used in building models and prototypes of solid objects and components. Polylactide aliphatic copolymer. Biodegradable CPLA is a mixture of lactide and aliphatic polyesters. It can be either a hard plastic (similar to PS) or a soft flexible one (similar to PP) depending on the amount of aliphatic polyester present in the mixture. A (substance or object) capable of being decomposed by bacteria or other living organisms and thereby avoiding pollution. Relating to a compound that breaks down into simpler compounds by stages. During the degradation of a degradable compound, well-defined intermediate products are created. Compostable means that a product is capable of disintegrating into natural elements in a compost environment, leaving no toxicity in the soil. This typically must occur in about 90 days. Some companies advertise their products as merely biodegradable. The Forest Stewardship Council (FSC) is an international non-profit, multi-stakeholder organization established in 1993 to promote responsible management of the world’s forests.